I am running the poll for the next book in our Re-read Saturday feature. We are nearly done with The Science of Successful Organizational Change! As in past polls please vote twice or suggest a write-in candidate in the comments. We will run the poll for two weeks. Let the voting begin! I had intended to spend the last entry our re-read of the The Goal waxing poetic about the afterward in the book titled “Standing on the Shoulders of Giants”. Suffice it to say that the afterward does an excellent job describing the practical and theoretical basis for Goldratt and Cox’s ideas that ultimately shaped the both lean and process improvement movements since 1984. The Goal is important because it introduced and explained the theory of constraints (TOC), which has proven over and over again to be critical to anyone managing a system. The TOC says that the output of any manageable system is limited by a small number of constraints and that all typical systems have at least one constraint. I recently had a discussion with a colleague that posited that not all systems have constraints. He laid out a scenario in which if you had unlimited resources and capability it would be possible to create a system without constraints. While theoretically true, it would be safe to embrace the operational hypothesis that any realistic process has at least one constraint. Understanding the constraints that affect a process or system provides anyone with an interest in process improvement with a powerful tool to deliver effective change. I do mean anyone! While the novel is set in a manufacturing environment, it is easy to identify how the ideas can apply to any setting where work follows a systematic process. For example, software development and maintenance is a process that takes business needs and transforms those needs into functionality. The readers of the Software Process and Measurement Blog should recognize that ideas in The Goal are germane to the realm of information technology. As we have explored the book, I have shared how I have been able to apply the concepts explored to illustrate that what Goldratt and Cox wrote was applicable in the 21st century workplace. I also shared how others reacted to the book when I read it in public or talked about to people trapped next to me on numerous flights. Their reaction reminded me that my reaction was not out of the ordinary. The Goal continues to affect people years after it was first published. For example, the concept of the TOC and the Five Focusing Steps proved useful again this week. I was asked to discuss process improvement with a team comprised of tax analysts, developers and testers. Each role is highly specialized and there is little cross-specialty work-sharing. With a bit of coaching the team was able to identify their process flow and to develop a mechanism to identify their bottleneck(s) to improve their through put. Even though the Five Focusing Steps were never mentioned directly, we were able agree on an improvement approach that would find the constraint, help them exploit the constraint, subordinate the other steps in the process to the constraint, support improving the capacity of the constraint, then reiterate the analysis if the step was no longer a constraint. Had I never read The Goal, we might not have found a way to improve the process. Perhaps re-reading the book or just carrying it around has made me overly sensitive to the application of the TOC and the other concepts in the book. However, I don’t think that was the real reason the material is useful. Others have been equally impacted, for example, Steve Tendon, author of Tame The Flow, and currently a columnist on the Software Process and Measurement Cast suggests that The Goal and the TOC has had a significant influence on his groundbreaking process improvement ideas. 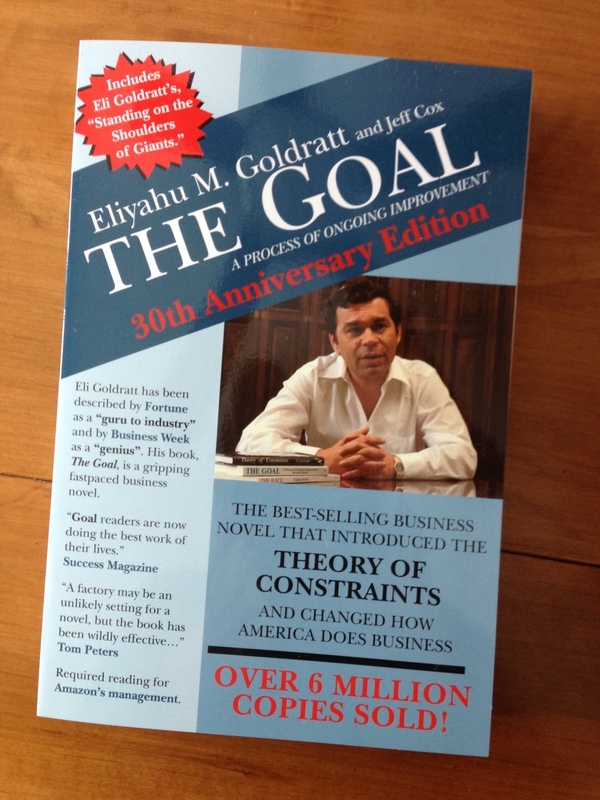 Bottom line, if you have not read or re-read The Goal I strongly suggest that you make the time to read the book. The Goal is an important book if you manage processes or are interested in improving how work is done in the 21st century. How has The Goal impacted how you work? Have you been able to put the ideas in the book into practice? 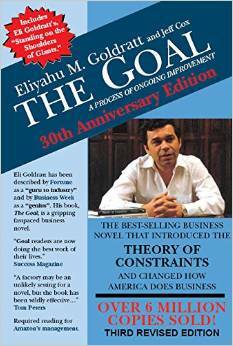 What are the successes and difficulties you faced when leveraging the Theory of Constraints? Do you use the Socratic method to identity and fix problems? Next week we begin the re-read of The Mythical Man-Month (I am buying a new copy today, so if you do not have a copy, get a copy today. I will be reading this version of Man-Month. Remember that the summary of previous entries in the re-read of The Goal have been shifted to a new page. Also, if you don’t have a copy of The Goal, buy one and read it! If you use the link below it will support the Software Process and Measurement blog and podcast. Dead Tree Version or Kindle Version. Epiphanies, the profound and sudden flash of understanding, in any field are rare; however, when they do happen they generally transform the person that has the revelation but don’t always have an impact on those around them. Sitting on a plane from Los Angles this week as I prepared to write this entry of Re-read Saturday, the person next to me pointed at my copy of The Goal and stated “I read that book, it changed my life.” As I have re-read The Goal I have been amazed at the number people that have stopped me to make sure I knew that they had read the book, also. In today’s entry, the penultimate entry, Alex has an epiphany and discovers the answer to Johan’s final question to Alex. Chapter 39. Bill Peach asks Alex to visit him and explain why his ideas are working. Meanwhile, back at the plant all heck breaks loose. The new orders have stressed the system. Random problems in front of the bottleneck used up all of the buffer in front of the bottleneck steps. The buffer had been used to keep he throughput through the bottleneck smooth and at maximum utilization. Once the buffer had been used up, the random problems caused work to get to the bottleneck in waves, causing the bottlenecks to be alternately starved and swamped. This problem caused the plant to fall back to overtime and expediting work. Alex leads a session with his team (soon to be Bob’s team) to find the root cause of the problem. In the end the problem turned out to be that the new order had reduced the excess capacity in the plant. Without changing the buffer in front of the bottleneck, the reduction in excess capacity meant that any shock to the system would quickly impact the bottlenecks which in turn would negatively impact the plants ability to deliver. The team decides they need to rebuild the buffers to anticipate some level of shocks, using overtime and for the time being increase the delivery lead time. Once a course was decided upon, Bob and “his” team put it into action. Chapter 39 marks the transition of Alex to being division manager and Bob to plant manager. Chapter 40. Alex, now division manager, and Lou, now Alex’s division comptroller, discuss the problems they have in front of them as they make the commute home from division headquarters. The problems at the division level are seemingly insurmountable. Examples they discuss include a delay introducing new product models (even though there is demand) so that organization does not have to mark down old product currently in inventory. Lou and Alex decide to apply the five step process to the problem: however, both agree, that while the problem is important it not urgent enough to need to break family commitments that evening both men had. This is unlike earlier in the book when Alex and his team would practically live in the plant. In the vernacular of Agile, Alex has discovered a sustainable pace. When they reconvene in the morning they struggle with how to apply the five step process to the division. They determine the constraints at the division level are the policies that drive the wrong behavior. Both Alex and Lou struggle with how to apply the process when faced with concepts like policies rather than something tangible like a production process when the epiphany strikes. I anticipate that the re-read of The Goal will conclude next week with part 18. Our next book will be The Mythical Man-Month (I am buying a new copy today so if you do not have a copy . . . get a copy today and please use this version of Man-Month). Remember that the summary of previous entries in the re-read of The Goal have been shifted to a new page (here). Repeat if the bottleneck has been broken. Ralph (computer guy) voices a concern that they really had not done step three. After some discussion the team finds that the by constraining how work and material enter the process they really had subordinated all of the steps in the process to the bottlenecks. Remember that the work and material entering the process had been constrained so the bottlenecks were 100% utilized (no more, no less). During the discussion, Stacey (materials) recognized that the earlier red/yellow card approach the team had used to control the flow of work into the bottlenecks was still in place and was the cause of the problems she had been observing (Chapter 36). In order to deal with the problems caused by earlier red/yellow card approach and to keep everyone busy, Stacey admitted to have been releasing extra work into the process therefore building excess inventory of finished goods. The back of the envelope calculations showed that the plant now had 20% extra capacity therefore they needed more orders to keep the plant at maximum capacity. Alex decides go see Johnny Jons (sales manager) to see if they can prime the sales pump. These observations led the team to the understanding that every time they recycled through the process they should have re-questioned and revalidated EVERY change they had previously made. The inertia of thinking something will work because it has in the past or because it has for someone else is often not your friend in process improvement! Chapter 38. Jons, Alex, Lou (plant controller), Ralph and one of Jons more innovative salesmen meet at headquarters to discuss where they can come up with 10 million dollars of additional orders. During the discussion it comes to light that Jons has a potential deal that he about to reject because the prices are well below standard margins. Alex points out that since the plant has excess capacity the real cost to produce the product is far lower than Jons is assuming (labor and overhead are already sunk costs). The plant could take the order and make a huge profit. Alex and his team convince Jons to take the order if the potential client will commit to a one year deal. They further sweeten the deal by committing to a quick deliveries (something other companies can’t emulate) in order to avoid starting a price war. Jons agrees to accept the order as the potential client is well outside of the company’s standard area of distribution therefore will not impact the margins they getting on other orders. On the way back to the plant Alex, Lout and Ralph reflect that they had just seen the same type of inertia that the team discovered the previous day in their process improvement approach and that Alex’s new role in changing the whole division will need to address even more organizational inertia. Later Alex and Julie (wife) reflect that the key to the management practices Alex is searching for lie in the application of the scientific method. Instead of collecting a lot of data and making inferences, the approach Johan had taken begins with a single observation, develops a hypothesis, leverages if-then relationships and then tests those relationships. Alex searches popular scientific books for inspiration to his management questions. When they discuss the topic again, Julie, who has continued to read the Socratic Dialogs, points out that they follow the same if-then pattern that Alex has described as Johan’s approach. I anticipate that the re-read of The Goal will conclude in two weeks with part 18. Our next book will be The Mythical Man-Month (I am buying a new copy today so if you do not have a copy . . . get a copy today and please use this Man-Month). I recently had a long discussion about whether it was more important to solve an urgent and specific business problem or to create a culture of process improvement that would avoid crises in the future. My colleague described the immediate problem as threatening to the entire organization. The obvious answer was that the immediate problem needed to be addressed. The question then became whether consultants should be engaged to provide the answer or to help the organization discover the answer. I suggest that doing the later actually negates the first question by generating a solution to the immediate problem while creating a culture of process improvement. Johan in The Goal illustrates this nicely. He helped Alex and his management team discover the answer while building a culture of process improvement. Chapter 33 begins with Alex working on assembling his new team. He begins with Lou, the plant accountant. Before Alex can ask him to come with him, Lou explains to Alex that another old measurement has been causing problems with how the plant is perceived and how it behaves. Inventory is accounted for as asset on the balance sheet even though inventory is a liability. Since the plant has become more efficient it is carrying less inventory therefore reducing the assets reported on the balance sheet. During the period of time that inventory was drawn down to the levels needed by the more efficient process the plant looked as if it was increasing the amount of liabilities. Now that a new equilibrium in inventory had been established the problem was not an issue, however Lou notes that, “measurement should induce the parts [of the process} to do what is good for the organization as a whole.” Lou is ready to help Alex and is pumped to focus on building a better measurement program. Alex approaches Bob Donavan, the plant production manager, to become the division’s production manager. Bob points out that the Burnside order that sealed Alex’s new deal was engineered. Alex and his management team had not just “taken” the order, but rather had worked out the best way the order could be delivered and then had negotiated a deal that benefited everyone. Bob wants to find a way create and document a process in which the plant and engineering can be an integral sales. A process and documentation is needed so that the plant leadership team does not need to be intimately involved in every order. Bob Donavan wants to stay at the plant and become the new plant manager and wants Stacey in materials to become the new production manager. They find Stacey working on a new potential problem. Stacey has identified that there is a class of resources called capacity constraints resources (CCRs). CCRs are resources that have constraints, but are not bottlenecks. As the processing of work through bottlenecks is improved, CCRs risk becoming bottlenecks which Will negatively impact produvtuvity. Process improvements need to be continually be made across the entire system. Alex finally turns to Ralph. Ralph points out that he now feels like he is an important part of the team rather than just the computer nerd in the corner. He walks Alex through his ideas of building systems to support engineering, managing buffers and for better measurement. The experimentation that led to changing how the plant works has changed how Alex’s management team thinks about their jobs. Asking questions and experimenting with changes to the process those questions generate has yielded a much higher level of involvement and commitment. Chapter 34 jumps to Alex and Julie sitting their kitchen drinking tea. They are discussing how each of Alex’s current team is exploring ideas that might not have an answer. Julie points out that if Johan had not cut him off by suggesting he trust his own judgement Alex might be reaching out to Johan for suggestions rather than trying to work on them as a team. The discussion of Johan brings them back to Johan’s last question to Alex. Johan had asked, “What are the techniques needed for management?” Julie suggests that since the questions that Alex’s management team each is currently working on will be around after Alex moves to his new job, why not engage them in answering Johan’s question. They have as much of a stake in the answer as Alex does! Alex pulls the team together and they spend their first session discussing and drawing the many ways Alex could determine what is going on when he start the new job. There are many ways to answer the question of what is going on. Each yields a different answer based on differences in perspective, approach and an arbitrary order of arranging the results. The wide range of ways to think about the problem make it difficult to actually determine a solution. The group agrees to meet the next day. Chapters 33 and 34 reflect a shift of focus. With the plant saved, Alex is faced with a need to generalize the process that was used so that it can be used for different problems or scaled up to the next level based on his promotion. This week I attended and spoke at the CMMI Global Congress. It was a great conference, and as with most conferences, the conversations in the hallways were as interesting as the presentations (including mine). I had a lot conversations about lean, Agile and scaling Agile, and while the attendees as a whole saw the value, there are still a few that view Agile and lean concepts with derision. These conversations, in conjunction with today’s re-read segment of The Goal, led me to consider whether much of the underlying resistance was being generated by fear; in particular the fear of discovering that what you know is no longer relevant. People facing that fear generally react in one of two ways: reinvention or rejection. In today’s segment Hilton Smyth chooses one of those options. . .
Chapter 31 Alex appears for the plant review, which is being chaired not by Bill Peach (Alex’s boss) but rather Hilton Smyth. Hilton is the assistant division controller. When Alex suggests that they wait for Bill Peach, Hilton indicates that he will not be coming and that his (Hilton’s) report will tip the scales on whether the plant stays open or not. The early exchanges clearly establish that Hilton does not buy into the turn around that Alex and his team have engineered. Alex reiterates the three core findings that have driven the turn around. Instead of balancing capacity with demand, they are focused on maintaining and improving the flow through the plant. For resources that are not bottlenecks, the level of activity from which the system is able to profit is not determined by individual capacity, but rather by some other constraint. Utilization and activation are not the same. Hilton believes that Alex’s deviations from the tried and true formulas for batch size, capacity utilization and per unit costing are hiding problems that will cripple the plant in the future. Those tried and true formulas are central to Hilton’s perception of his own relevance, and he can’t see that with both profits and plant throughput up and inventory down that the plant is now on very solid footing. The report to Peach will be bad. After the meeting, Alex decides to confront Peach. Peach listens as Alex tells him that Smyth would not listen to reason. Peach summons Jons (head of sales), Ethan Frost (division controller and Smyth’s boss) and Smyth. When they are assembled, Peach announces that Jons, Frost and himself have been promoted, and that Alex will also be promoted to head the division. While unstated in the book the inference is that recent profitability and the new orders from Bucky Burnside have made quite the stir at corporate. (In my head I could hear Smyth blustering, as much of his previous knowledge and experience became less relevant). The chapter ends with Alex reaching out to Jonah to ask for help running the division. What he receives is a congratulation and advice to learn to trust his own judgement rather than to needing outside support. Chapter 32 uses Alex’s and Julie’s celebration dinner as a backdrop for a discussion about the promotion as part of a journey and Johan’s method of coaching. Johan didn’t just provide answers to the questions Alex posed, but rather pushed Alex in the right direction and made him and his team work for the answers, much like the Socratic method of generating critical thinking based on asking and answering questions. This journey helped Alex generate ownership in new concepts that flew in the face of what he and his team previously thought to be true. The struggle to generate answers gave Alex and his team the courage to implement their new ideas. It should be noted that the feedback that their early successes generated also helped generate the courage to try further experiments (this dovetails nicely to the ideas in Kotter’s Leading Change – an earlier re-read).